And while you are there, read the other columns as well. There is some amazingly good writing and information there every month. The reason why it’s difficult to change a habit is because you might intend one thing, but you’re working against the background of an entire lifetime of experience that has taught you how to think and behave. It’s your comfort zone, it’s your habit, it’s your addiction. … If you’re not willing to think and perform differently, how are you ever going to change your performance? It’s been about a year – actually a year and two months, since my 2nd kyu exam. My 1st kyu exam will be this morning. I think of each exam like New Year’s Day – a time to look back, and to look ahead. This year has been one of transitions. Bringing things into alignment. Getting behind center. Grounding. Being clear. I changed the way I work. With my employer’s and husband’s support, I cut back on my hours, and now work exclusively from home. This has meant a huge reduction in stress and a better physical workspace for me. It allows more time and flexibility for my Aikido training, and lets me focus on writing as my primary activity. Over the past few months I have upgraded my office, with a new computer and printer, and all new software tools for writing and design work. There have been a few steep learning curves, but now I’m off and running. There have been a lot of little things, too. A long-delayed household improvement is finally on track. My blog on AikiWeb just went over 200,000 views. I turned 50. I’ve happily spent over 250 training days on the mat. I have helped out in the kids’ classes, and even taught a few. There were seminars and road trips, projects and parties. It’s been a full 14 months! Starting last October (2012) I seemed to have a never-ending string of health problems: I injured my shoulder taking a roll in an awkward way. A bad cold turned into weeks of bronchitis, followed by gout in my right foot. At some point during all of this my neck and upper back muscles seized up and caused trouble for the radial nerve to my left arm.I was finally able to train fully just in time to get busy preparing for my exam. While I have enjoyed training, it’s also been a painful year. 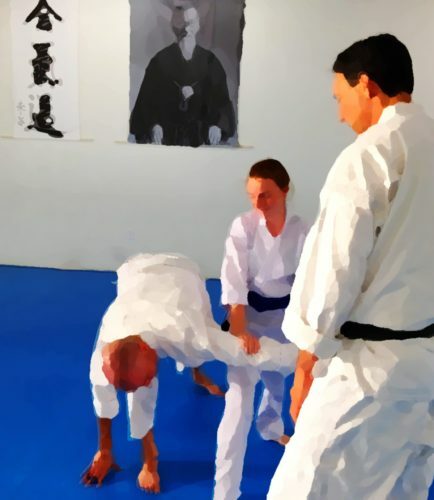 Ukemi, the aspect of Aikido I am most dedicated to, the part of the practice where I find the most value, and where I need most to improve, was also the most difficult for me to access. I watched a lot of my friends grow and progress throughout the year, and felt left behind. I recently had a good conversation with Sensei about this, and am looking forward with renewed enthusiasm to focusing more on improving my ukemi. It’s been a time of changes and new opportunities. Even the time will be changing tonight. Longer days and warmer weather are coming. Everything is looking brighter. I can’t wait for Monday night’s classes! It’s live! My first book, “A Bowl of Love — How to Make a Big Green Dojo Potluck Salad,” is now available for sale on Amazon, for Kindle and Kindle Reader apps! Click the photo to go to it on Amazon. Only $2.99, and Amazon Prime members can borrow it for free! Give it a look, and give it some love. Enjoy! 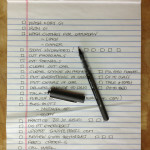 My to-do list for the day before my 1st kyu exam. 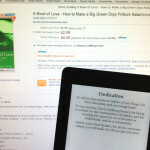 I am also publishing my first book today: “A Bowl of Love — How to Make a Big Green Dojo Potluck Salad”. I’d better get busy checking these things off! Yesterday I completed one entire month on the mat. I’m preparing for my first kyu exam, which will be this Saturday, so I’ve been training even more than usual. I did it just because I could, and because it seemed to help me keep up the proper momentum, and stay loose physically. The nerve problem I was having with my neck and arm has been improving with constant activity, and I’m generally feeling very good. So why stop? When I shared that milestone with my friends, one suggested that I must be experiencing an “awesome growth spurt." Actually, no. Although I have been enjoying training and having a lot of fun preparing for exams with my dojo mates, I’ve actually been fairly perturbed by my lack of progress. Sometimes it’s felt like I’m going backward. It’s been discouraging. For for each new "aha” moment there are three more things I see I seriously need to work on. Opening my eyes to a thousand details and endless room for refinement still counts as opening my eyes. Discovering how I process and remember information (or fail to) still counts as discovery. Becoming more aware of the holes in my technique still counts as becoming more aware. Starting to see some of the bigger picture — the patterns and relationships in techniques — still counts as starting to see. Learning where my blind spots are still counts as learning. Knowing what I need to work on still counts as knowing. I will do my best on Saturday, and I’m sure I won’t be satisfied with that. But I will be moving into the next phase of my training better equipped to learn and develop further, with a broadened perspective on the art, and deeper appreciation for what’s available through training in it. And that still counts as progress.